This week’s Tablet column is here. I know that soon enough, Josie will be way too cool and tweeny to want anything to do with me, so I should cherish the waning time in which she wants to be identified with her family. This year she wanted us all to do Harry Potter costumes. She was to be Hermione; Maxine was muscled into being Crookshanks, Hermione’s familiar; Jonathan and I could be whoever we wanted but it would be BEST if he were Hagrid and I were Professor McGonagall. I liked the idea of being Dolores Umbridge, but the fact that I refused to pay more than $25 for a pink wool suit or cape put the kibosh on that. And Jonathan didn’t want to be Hagrid — too hot. So we nuked the family concept. Jonathan and I went as the Draper children from Mad Men (aka a hobo and a gypsy, wearing “Hello my name is Bobby” and “Hello my name is Sally” name tags). 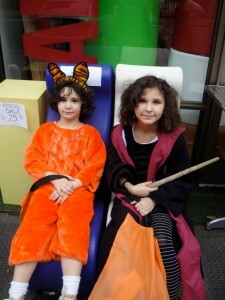 The kids stayed Potteriffic and were FINE with us abdicating our parental responsibilities. Next year I’m gonna campaign hard for a family Percy Jackson costume. (We’re reading the books at bedtime. OMG, so awesome. Arete. Totally. As a onetime Folklore & Mythology major, I cannot express how much I adore them. They are hilarious and witty and exciting and in our family’s case they achieve author Rick Riordan’s aim of getting kids interested in Greek myths. And what a great message for all kids, that having ADHD and dyslexia doesn’t mean you’re not super-smart.) 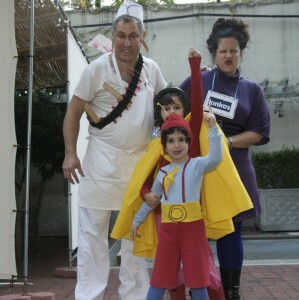 I predict that will be the end of the era of family Halloween getups. But I’ll still get to eat my children’s candy, dammit. ADORABLE!!! How cool i didn’t know you had a blog, snazzy snarly!